The chargery BMS 8 is a very simple and effective way of keeping 3-8S Lithium batteries balanced, protected from overcharge and discharge. 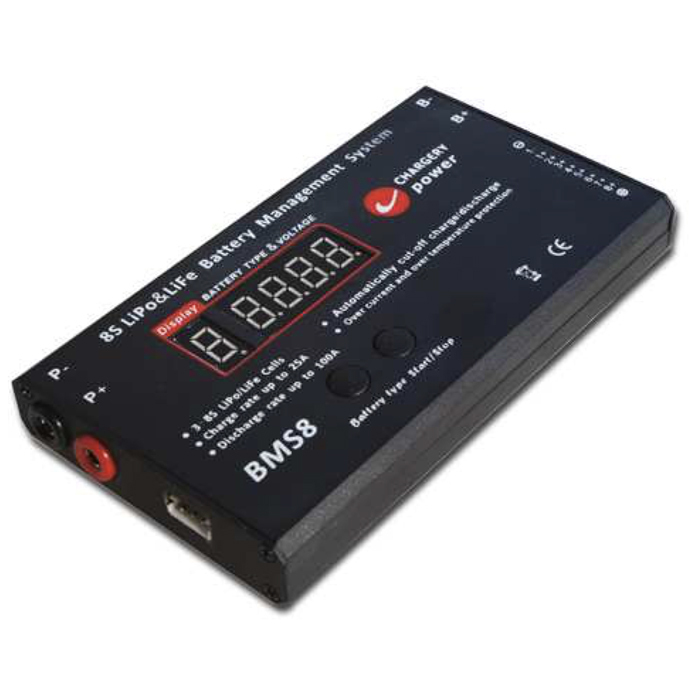 BMS 8 is one of the few BMS's that shows you individual cell voltages and status messages on its LED display. Finally a simple BMS for small systems that shows you what it's actually doing! BMS 8 can also be used for simple charge protection and cell balancing by only charging through the device, not discharging. This allows you to use it in high current applications that already have a low voltage cutoff. If the temperature of the battery is too great. When charging is cut off becuase of a cell imbalance BMS 8 will start balancing and then resume charging once the imbalance has been corrected. Detect and display pack voltage, difference of cell voltage and temperature, each cell voltage by microprocessor, 100% calibration before delivery make sure the high accuracy. Cut off discharge when 25A to 100A discharge current for different continuous time. It means the e-scooter don’t lose power under 100A, such as the e-Scooter can be powered at 40A for 1 second at least, and cut off, then resume automatically. 100A or more when short circuit, cut off discharge automatically and resume 10 seconds later. Dual protection by program and hardware, more reliable. Low Quiescent current design, BMS8 draw current from all cells to keep the cell voltage balanced and minimize the power consumption in stand-by. Energy storage systems like powerwalls and solar systems. Current drain for balancing: 300mA/cell.